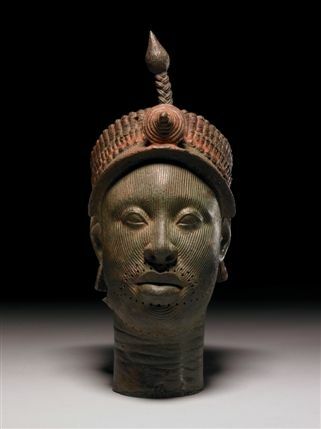 This Ori Olokun head (or one like it) was first discovered in 1910 in West Africa (Nigeria today). It is typical of many others that were made between 1300-1600 AD in Ife (ee-feh), a powerful city-state with a highly evolved indigenous culture that dates back to the 6th century. The bronze heads were made by a lost wax process and contain mostly brass and copper alloy, materials the kingdom obtained from Portuguese traders who were active in the region at the time. See here about the exhibition at the British Museum in 2010. Ife is still today a cultural and spiritual center in Nigeria. Probably unknown to Picasso and his contemporaries, who had first seen African tribal art “in May or June 1907, [when] he visited the ethnographic museum in the Palais du Trocadéro in Paris”, the Ori Olokun heads are technically and artistically sophisticated, products of a highly evolved culture contemporary with Renaissance and the subsequent Enlightenment in Europe. The German adventurer who made the discovery fantasized that “he had seen the face of Poseidon, sea god of the ancient Greeks – proof, he claimed, of the existence of an African Atlantis.” The heads and most of the artwork were subsequently sold to various museums around the world. There are intriguing stories about copies, or copies of copies. By 1910, Picasso had started to move from his prismatic and fragmented Analytic Cubism to Synthetic Cubism, which included collages and found objects. He most likely did not see these Ife heads and other brass plaques. For him, like most in the West (even today), African art remained tribal and primitive and inspired him to return to a more ‘primal’ state of art creation. He certainly got it wrong but it did not matter. Cubism was the synthesis of many impulses and influences, not least Cezanne’s (then considered bizarre) multiple-perspective paintings which I mentioned here earlier this year about the history and continuity of modern art. See also here how African art influenced 20th century abstract art. The Ori Olokun heads, mostly representing kings and queens, are serene, noble and, without fussy details, carry our eyes into a contemplative mode – there not being details to attend to. Some think they look Egyptian. I see also the impassiveness of Buddha statues or the early Chinese Han dynasty human figures (220 BC – 206 AD). This suggests the power of abstraction which may be built anatomically into our eyes’ peripheral vision – and that our own unconscious could complete the details. Another possibility is perhaps the lack of fine tools for detailed carving. At the same time, these Ori Olokun heads bring to mind the photographs of the renowned contemporary South African artist Zanele Muholi. Her ongoing project of portraying the LGBTI community, started in her native Johannesburg in 2006 demonstrates that same fortitude and grace that share an African sensibility. There is no doubt that those Portuguese traders in West Africa between 1415 and the 1600s would have had with them implements and daily objects of their Renaissance culture from home. And what is amazing is that Renaissance art, steeped in Catholicism, did not leave a mark on the Ife cultural artefacts – likely because the relationship was equal trade, not colonization. This is in stark contrast to the heads and torsos from Ecuador in the 18th century in the Hispanic Society Museum & Library New York. See here the piece by Judith Dobrzynski in the Wall Street Journal, which made me think of these Ife sculptures. The finely crafted Ecuadorian pieces portray fear and torture – they are meant to teach, which is what religions do. (The discussion in the comments section is even more interesting). The Spanish colonizers had brought Catholicism to Ecuador and other South American countries. After all, humans originated in Africa around two million years ago when Homo erectus, an extinct ancestor of modern humans, migrated to Asia (Java Man and Peking Man fossils) and possibly Europe. They were known to care for the weak and old and used hand axes, the first major innovation in stone tool technology. They also used fire. Modern Homo sapiens are only about 200,000 years old and they migrated also, out of Africa starting about 60,000 years ago. They were probably driven by need for food and their paths have been traced by modern techniques like gene flow and morphology studies. Picasso was right after all, we do need to look back to Africa to find our roots – and more than just for art.